Hi friends! 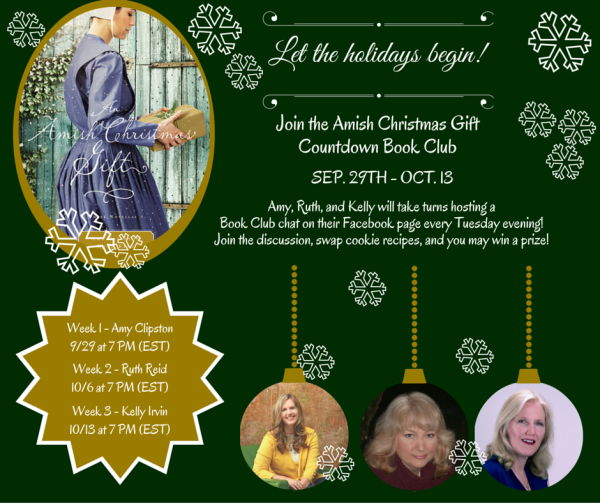 To countdown the October 6th release of AN AMISH CHRISTMAS GIFT, let’s have a book club party to celebrate! Starting on 9/29 and happening every Tuesday through 10/13, we will take turns hosting special book club chats on our Facebook pages for each novella in the collection. Each week, you can chat with us, swap recipes, and enter to win prizes! Our first book club chat will be next Tuesday, September 29th at 7:00 PM (EST). Ready to join the party?